What Does A Career In Tourism Look Like? What Does A Career in Tourism Look Like? Tom Urban’s journey to Destination NSW and beyond. Tourism is a broad field, with lots of different and exciting opportunities. No two careers are ever the same. Plus, it’s a booming industry. This year, it’s been recorded as one of the fastest growing of all the sectors. Over the last twelve months, tourism brought a record $41.3 billion into the Australian economy and supported over 100,000 jobs. There’s a lot to love about what you do, if you choose to go down this career path – as Tom Urban discovered. Tom is a Sydney boy, born and raised. He grew up enjoying all the incredible beauty that Sydney’s unique coastal city has to offer. Driven by his passion for his hometown and a desire to contribute something positive to society, he decided to enrol in a Bachelor Degree to gain the skills and knowledge he needed to land his dream job. “When I graduated, I got a job at Destination NSW working as a Senior Strategic Insights Analyst. This position showed me how important research and evidence is in formulating tourism strategy, which is something I will never forget. After a couple of years in that role I moved into a position as the North Coast Zone Manager, looking after everything from the Great Lakes up to Tweed in NSW. My job was to be the middleman between Destination NSW and the regions. This was a great role because it touched on everything – marketing campaigns, regional strategies, stakeholder management and project management. When you love what you do, you never hate Mondays! So, what exactly is it that Tom loves about his work in tourism? “It is a great industry, I love everything about it. I wouldn’t have it any other way, though it does change your ability to take a holiday. My wife rolls her eyes every time we go away – each place we visit I keep telling her about what they are doing right and wrong, and how they could grow their destination. I guess I enjoy it that much. I also see it as a great opportunity to help in the form of jobs and economic activity, whether it is a developing nation or a regional town. You don’t need millions of dollars to start a tourism industry. You just need something interesting to visitors and slowly grow it from there. I wanted to create something unique, to really be able to put my brain to work in a strategic way and to help people while I was doing that. 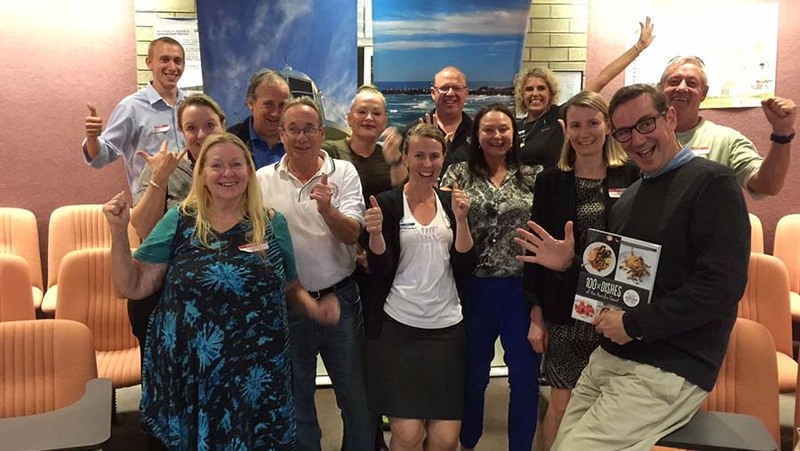 In my position as Zone Manager at Destination NSW, I was able to do just that. There was nothing more rewarding than speaking to a tourism manager in a small town, or a business that is struggling to get by, and talking them through everything they can do to grow and to be able to offer them help. Tom left his job at Destination NSW in 2017, to go and start his own tourism consulting business, Tourism Foundry. His new company was quickly offered a contract with Destination NSW, to run one of their programs. Now, he’s working on building up his client base and growing his consultancy. “The contract with Destination NSW has really helped me to keep at it. The trick now is to keep working my contacts in the industry and try to build my business. So, what’s next on the horizon for Tom? “It’s hard to say. For the time being, I will keep working on my business and see how that goes. Photo taken after speaking at a tourism workshop in Forster. If you’re considering a career in the industry that Tom loves so much, your first step is to enrol in a course. See here for more information about studying Tourism and Travel at William Blue College. Don’t hesitate to contact one of the helpful staff with any questions.